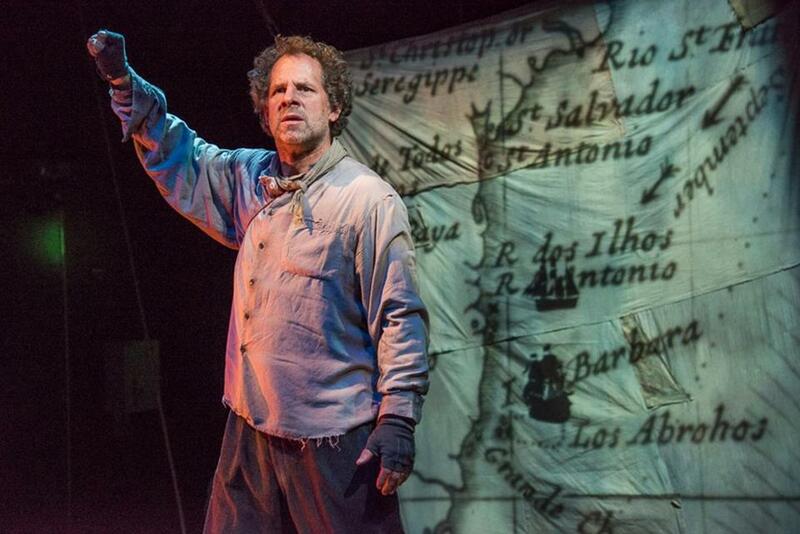 Benjamin Evett as the mariner in “Albatross,” presented by Poets’ Theatre. The seemingly anachronistic elements in fact resonate with all the period-appropriate verisimilitude that elsewhere rounds out the mysterious figure of Coleridge’s poem into a fully fleshed character, perhaps nodding at the literary concerns that drew Evett and writing partner Matthew Spangler to the material in the first place. So how to dramatize a story in which the central character lacks that most essential item on an actor’s checklist, motivation? The answer found in this world premiere production is to amplify the power of the seaman’s tale by making it spring from a firmer ground than Coleridge offers. The poet’s mariner is a bearded, elderly oracle, who had performed unknown duties on a ship with an unexplained mission. Evett’s is rugged, rakish and not-so-ancient. (He appears to be in his 40s.) His story begins in the English port city Bristol, where putrid carcasses dot the filthy streets and “unsuspecting lubbers” are knocked out and stowed on ships to Shanghai. The sea voyage that goes horribly awry is a privateering mission, led by a sometime-pirate whose cruel exploits are described in stomach-churning detail. “Mariner” has always been an odd bird. With its deliberately anachronistic language, often-bewildering explanatory notes, and episodic story line that seems to scream of allegory but resists easy decoding, the poem has always sat somewhat uneasily within Coleridge’s canon. (He and William Wordsworth went back and forth on its merits, and Wordsworth was perhaps its firmer champion.) To the modern reader, the poem’s apparent moral — that “He prayeth best, who loveth best/ All things both great and small” — seems frustratingly inadequate after all the mysterious curses, supernatural spookiness, and portentous riddling. But its rich imagery, knack for coining a phrase, and implied comment on the power of storytelling make the poem rich territory for a contemporary examination. Director Rick Lombardo has Evett enter through a loudly creaking garage door at one end of the black box theater, then seemingly turn on the stage lights himself. Referring frequently to “the spirits” he says are watching the proceedings, the seaman doesn’t summon the Muse so much as tell the Muse to get off his back and let him get on with it. The framing devices, such as an initial monologue in Italian, do go on a bit long, and things come to a point where you almost want to yell out that it’s OK, we get it already. The piece reaches full speed once the mariner’s yarn reaches South America, and there’s a wonderful sense of growing dread as he describes the ship’s unfortunate travel southward toward “the bottom of the world.” Evett was the founding artistic director of Actors’ Shakespeare Project, and he imbues this piece with a Bard-like sense of man’s ability to observe, but not alter, the inexorable progress of fate. Evett’s charisma forges the sense that “Albatross” would be just as captivating an experience if he stood atop a sea chest and recited it in broad daylight on Boston Common. But that’s also a tribute to Lombardo’s skillfully unobtrusive use of well-chosen production elements. It takes a while before you realize the staging is not as sparse as it appears. Cristina Todesco’s poetically functional set design offers three patchwork sails that serve as canvas for Garrett Herzig’s scene-setting projections. The lighting design by Franklin Meissner Jr. is largely utilitarian until the story’s supernatural sequences, when it turns richly evocative. (The director’s own sound design is suitably spooky, but prone to awkward cuts.) The design elements almost sneak up on the audience, belying the no-budget patina present at play’s outset. Coleridge gave us the notion of an albatross around the neck as metaphor for a heavy burden. By this play’s conclusion, it becomes clear that the albatross of the title is not the felled seabird, but the tale itself. No matter how painful it is to share, this storyteller cannot resist his duty to tell it. And what artist couldn’t relate to that? Jeremy D. Goodwin can be reached at jeremy@jeremydgoodwin.com. Follow him on Twitter@jeremydgoodwin.